Below are a sample of experimenter activities: 10 Daily Extends and 16 Deep Dives. Try at least 3 “daily extends” and 1 “deep dive” to play and experiment with new ideas, formats, tools, and approaches. Use the hashtag #oextend to tweet your response to the prompts. After you have completed these activities, please narrate, curate, and share your experiences on your blog. The Daily Extend site was created as part of the Northern Capacity Building Initiative to provide a space for regular practice of spontaneous creativity through short challenges published every day. They are designed to extend your online skills. These daily creative tasks follow in the footsteps of The Daily Create. As described on the The Daily Create (TDC) website: “Each assignment should take no more than 15-20 minutes. There are no registrations, no prizes, just a community of people producing art daily. Developed as part of the ds106 open course on digital storytelling, TDC is open to anyone who wants a regular dose of creative exercises (and is more fun than jumping jacks, pushups, and P90X)”. Let’s experiment with some of the Daily Extend activities. Look at the hashtag links (e.g. #oext1) to get a full description of the activity and to see some of the creative responses. Try at least 3 of these Daily Extends. Share what you create by sending a tweet to @ontarioextend and be sure to include the hashtag of the task (#oext1 or #oext56). #oext1 Can you think of an Everyday Metaphor for Extending? We have chosen the verb extend as a metaphor for this project. What does it mean to you? Sure, you can look up definitions, but for our first Daily exercise, we ask you to look around your home or office for an object that allows you to extend the capabilities of a task or utility. Show it in a photo. Open Culture features video, audio, and links to content that celebrates openness or features famous figures or historical moments. See if you can find something relevant to your interests or subject area, and tweet a link to it with as much content as you can fit in a tweet. 3. #oext 4 Google your own name. Find the most interesting doppelganger. Do you have a double in this world that you know of? According to Wikipedia a doppelgänger is “is a look-alike or double of a living person, sometimes portrayed as a paranormal phenomenon” — can you find yours that bears your same name? If you do not get a match on your full name, try using just your first or last name. Or heck, just pick the closest result. Or maybe you can try https://findmydoppelganger.net/#oext6 How does my mobile phone see me? 4. #oext16 How does my mobile phone see me? We stare so intently at our devices, what do you think it sees of us from its perspective? You know what people look like when they are busily engaged with their mobile phone. What does the phone see? Take a photo, or better yet shoot a short video, with a view from your phone’s perspective. 5. #oext13 Define Yourself in One or More Noun Project Icons. Explore the Noun Project site for one or more icons that might represent you. Give credit to the source when you share the link. 6. #oext56 Book stack Title Mashup. Make a lead in for a story by combining books where they are stacked and pushing their titles together. 7. #oext62 What’s in it for me? In the Teacher for Learning module there is an activity that suggests we consider how the students might answer the question “What’s In It For Me?” or WIIFM, if acronyms are your thing. Think of a skill, concept, idea, or process that you know in your heart of hearts that could be really beneficial to your students, and WIIFM it for us. 8. #oext64 Taylor Swift Curriculum Design. Help us prepare a new program proposal for the Taylor Swift graduate certificate to OCQAS Credential Validation Service. We need to develop the course titles and short course descriptions. 9. #oext72 Slide Deck Beauty Pageant.Let’s have a slide deck beauty contest. Go through your slides and let us see your prettiest. Or, if you’re too shy, find a pretty one in this collection of about a million Open Education advocacy slide decks and nominate one from there. Just take a screenshot of the slide, perhaps with the Snipping Tool, and share it on Twitter. 10. #oext123 We are Collaboraters. 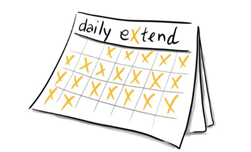 All the Daily Extend challenges can be accessed at this site. These challenges take a bit longer to complete than the Daily Extend activities. Complete at least one of them. Take a look at these course trailers and make a 30 second commercial or trailer for your course. Highlight a topic or concept for _____________, math, literature, philosophy, etc., by creating a Graphics Interchange Format (GIF) . Explore some online survey tools (via Google search) and conduct a five-question survey of your peers about ways to use technology-enabled activities. Create a video, to welcome students to your course, or your blog website, with one of the freely available tools highlighted in the Online lecture toolkit . Build or customize an openly licensed graphic or other resource for your discipline area, and share it via OER Commons. Find a Wikipedia article in your discipline that has inaccurate or inadequate information, go to the discussion page and suggest a revision. Is there a way you can use Google Lit Trips or maybe the Google Street View of Museums to create an activity for one of your courses? Use H5P (or a similar tool) to create an activity for your class to review for a test, or to assess prior knowledge about a topic. Curate a mini-lesson on a topic of interest using open education resources and via Google + Collections, Scoopit or Storify. Take a look at this example using Storify for inspiration. Remix and critically appraise a YouTube video using a free educator account for Mediabreaker. Create an Infographic to present data or explain a concept. Look at the Open Faculty Patchbook and make a contribution. Find an open textbook in your discipline area and write a review. Explore these Silly Useful Web Tricks and use one of them to create an activity for a course or presentation. Peruse The Agora Project Challenge Bank and complete one of the challenges. 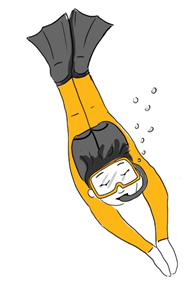 Do you have a suggestion for another Deep Dive Activity to add to our Experimenter Activity Bank? Send an email to extend@ecampusontario with your suggestion or you can share it via a tweet to @ontarioextend with the hashtag #oextend. Which activities did you choose? Write a reflection on your blog to share your experience. What did you use to experiment? Why did you choose to do whatever you did? How will you use the new ideas, formats or approaches that you experimented with when you are designing learning experiences? How you did it (what tools and resources). Why you chose those activities to experiment with. How your “experiments” turned out. What you would do differently.